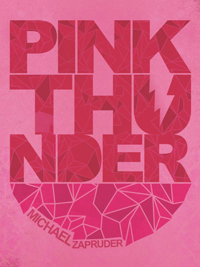 Full Disclosure: While I had nothing whatsoever to do with the making of this project, I have known and worked with Michael since 2004, and I wrote the introduction to the Pink Thunder book. However, I found the scope of this project to beg greater creative and cultural concerns than could be fully addressed in the introduction to the book. This is a little difficult to explain, but for a brief aberrant cycle in the history of human civilization, a violent minority of militaristic nations operated according to a spurious system based almost exclusively on the degradation of spirit via mass production and mechanized standardization, and on the pacification of the majority populace by reducing their access to education, nutritious food and health care, and increasing their access to pleasure-center stimulants. Weird, right? It’s likely you’ve never even heard of this cycle as its ideas were surely so overwhelmingly disproven and unanimously rejected as to be expunged from the annals of history.